Professional services is a staple of airport advertising. But having seen this one at least one thousand times I still don’t understand how it sells Capgemini. Is the blue-suited lady the consultant, and is she inspiring her clients to disrobe? 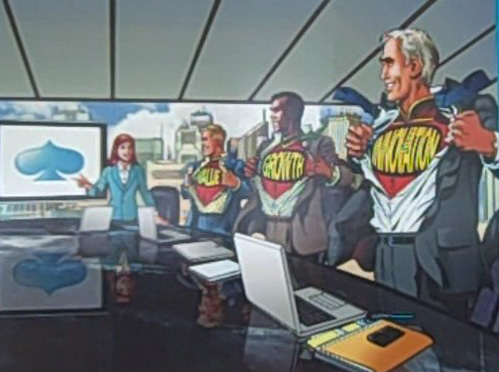 Or are the super hero-suited businessmen the consultants, and she’s their client or boss? Either way, it reminds me way too much of a scene from Charlies Angels than a Big5 Consulting ad should. These guys must cringe when they pass Accenture’s Tiger Woods ads. They may know how babies think, but they are clueless about how ad viewers do. 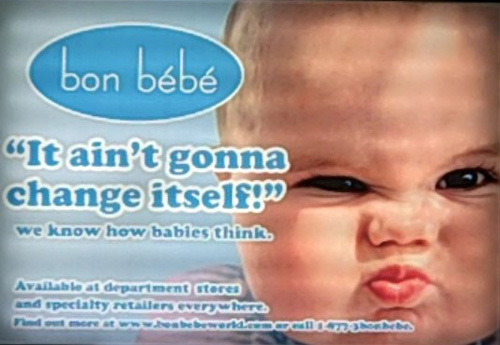 Bon Bebe uses a photo of a cute kid and a baby poop joke to draw attention. But then they get lost before explaining what they sell. Fortunately they mention their URL and phone number, so the alert traveler can note these and contact them later to ask what on earth they are doing with a toss-away ad. Sometimes the medium is the message. Advertising in the security bin I have to put my shoes is a great opportunity to point out my shoes areen’t what they used to be. Instead, internet darling Zappos inserts an ad which is oblivious to its unusual location. The graphic looks like an ad for a sports drink or gum. 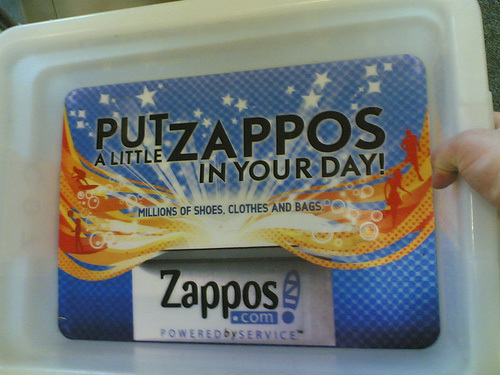 Why exactly should I put Zappos in my day? The ad is all about them. The Elusive Effective Airport Ad: Thanks, United. Amusing illustrations and lite copy gets United’s branding across without a bit of chest thumping. It’s rare to see great branding at the airport. In my opinion, this series rings the bell. This ad announces there’s micro-brew for sale. 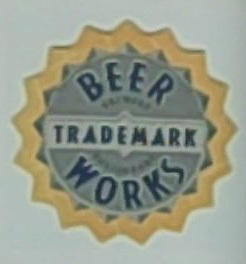 But it reads “Beer Trademark Works.” Wouldn’t it be better just to use the little “tm” symbol, and put a picture of some beer in a frosty mug in the center of this logo? Of all these ads, none of them actually show the product. That’s not always possible, but beer, baby clothes, and shoes are pretty easy to visualize. The first rule of sales in the shoe biz is “show them the shoe.” And it was Hannibal Lecter who said “We covet that which first we see.” This simple start could help make the creative for airport advertising more effective. 6 Responses to "Advertising at the Airport…The Island of Misfit Promotion"
Agreed – and what’s with advertising baby clothes at an airport? Is this really the mecca for finding fashion-conscious moms? Don’t they realize that any mom in an airport with a baby is either wiping spit-up off themselves or frantically trying to get the little darling to stop yawling before they get on the plane? While you can question the relevance of Tiger Woods to consulting, Accenture’s had a pretty good run with their “like a Tiger” campaign.